Next week GN solids control will ship 6 units of linear motion shale shaker and 2 units of jet mud mixers to India, they are for the operation of the 2 drilling rigs. The client owns their own oilfield, rigs and solids control systems, they need to replace their old equipments by GN solids control equipments. This is not the first order from this India drilling company, they ever bought 3 sets of solids control system for 2000HP rig and 1000HP rig 9 years ago, and then bought linear motion shale shaker, linear motion mud cleaner and vacuum degasser from GN with rig complete package, also the shaker screens for the shale shakers. Even the shale shaker with only 3pcs screens, but the effective screen area is up to 2.63m3, only a little smaller than 4 panel shale shaker GNZS94E, the client can replace less screens compared with 4 panel shale shaker, and they can remain all their shale shakers with same dimension shaker screens, so it is easy to stock shaker screens. The shale shaker installed with composite material frame shaker screens, which is designed for longer working life and longer storage time up to 5 years without getting rusty. The conductance and separation cut point is also larger than the steel frame screens, it is very popular among drilling companies. 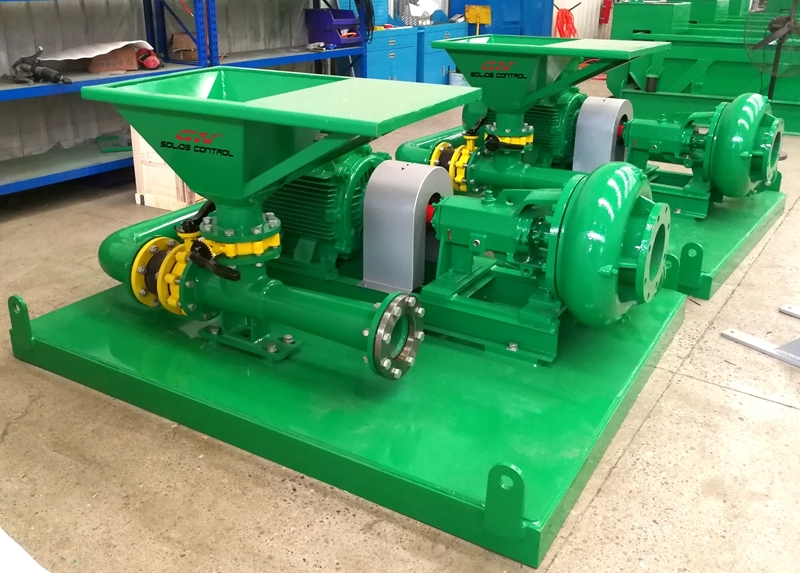 The jet mud mixer is the combination of mixing hopper, mixing pump and pipelines on the same skid, it is for convenient operation and transportation, the client can choose different models according to the mixing rate they required for the mud tank system. Except for linear motion shale shaker, GN also provide linear motion mud cleaner, decanter centrifuge, vacuum degasser, centrifugal degasser, mud agitator, centrifugal pump, mud gun, screw conveyor, etc equipments, welcome to send us your inquiry.